Shock Metamorphism: Shatter cones, PDF in quartz and feldspar grains. a K-Ar ages of 372 million years (m.y.) and 342 m.y. for impactites and 335 m.y. for pseudotachylites. Age recalculated to 342 ± 15 using post 1977 decay constants (J. Whitehead, 2002). The rubidium-strontium age of the crystalline country rocks at the Charlevoix crater is 1280 m.y., suggesting that the Rb-Sr clock was unaffected by the impact (Rondot 1971). 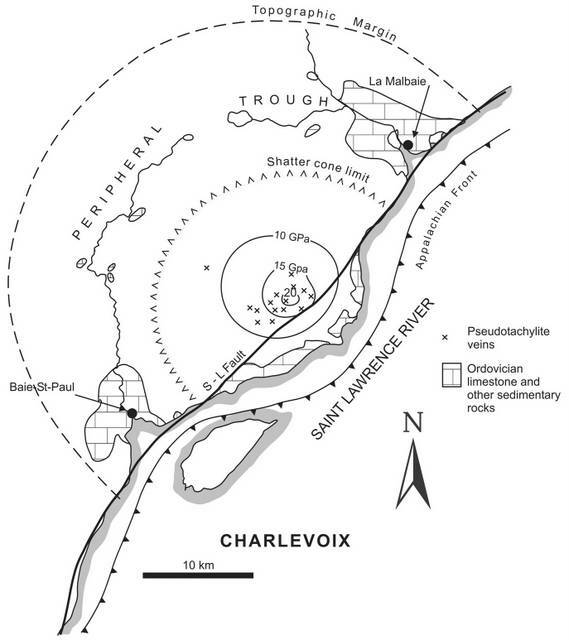 The Charlevoix impact structure in Quebec, Canada. The Charlevoix impact structure is circled in this Landsat image. This panoramic image of the Charlevoix crater looking east from about 2000 feet above the western most area of the impact modified zone taken from GOZooM. In the immediate foreground are the terraces and in the mid foreground is the annular peripheral trough (ring graben) visible as the ring of light coloured vegetation surrounding the central uplift region. The central peak, Mont des Eboulements, is silhouetted in the background against the St. Lawrence River. The town of Baie-St. Paul , visible at the right of the image, is at the south west termination of the crater’s annular peripheral trough. I took this panoramic image of the Charlevoix crater looking east from about 2000 feet above the western most area of the impact modified zone. In the immediate foreground are the terraces and in the mid foreground is the annular peripheral trough (ring graben) visible as the ring of light coloured vegetation surrounding the central uplift region. The central peak, Mont des Eboulements, is silhouetted in the background against the St. Lawrence River. General Area: The Charlevoix Impact Crater, a multi ringed basin with a central uplift (Rondot 2000), is located in southern Quebec on the north shore of the St. Lawrence River, 105 km NE of Quebec City and lies on the southern edge of the Canadian Shield. The structure was identified as a meteorite crater in 1965 with the discovery of shattercones in the area. Yours truly pointing our an in situ shatter cone within the Charlevoix impact crater. The hypothesis that the Charlevoix structure might be the result of a cosmic impact originated here in 1965 when this outcrop was first studied. 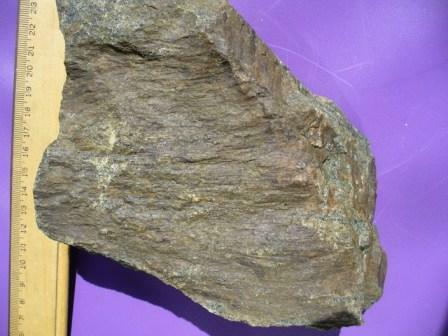 These “in situ” shatter cones were discovered at this location when Jehan Rondot was in the midst of routine regional mapping in the Charlevoix region (Rondot 1966). 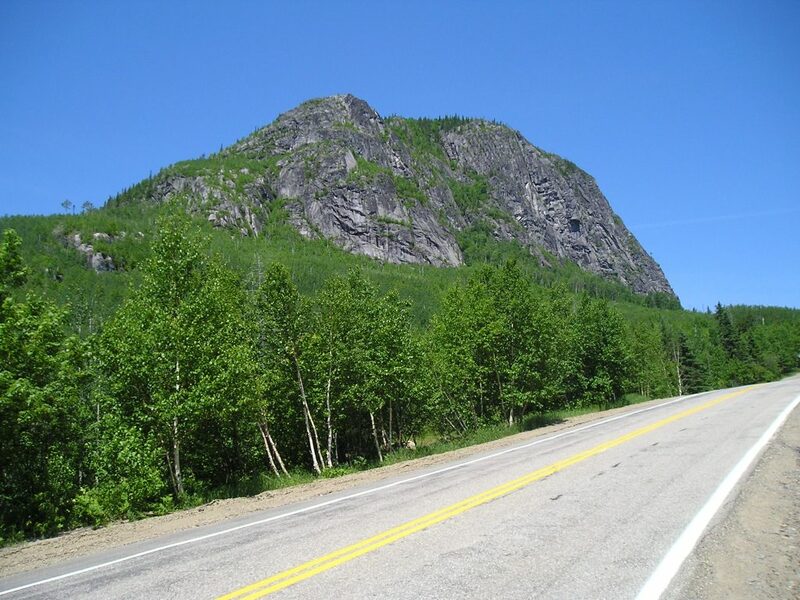 He recognized unusual fracture patterns in a well exposed roadside outcrop and later learned from John Murtaugh (who was mapping Manicouagan at the time) that he had discovered shatter cones (Dence 2004).. The initial dimensions of the crater were estimated to have been 28 km in diameter (the inner circle in the landsat image) and 10 km in depth immediately after the impact. The subsequent post impact crater collapse created the central peak and peripheral modification resulting in a final crater structure of 54 km in diameter (outer circle in the landsat image). Erosion has removed the original crater rim, some of the central uplift and the crater-fill products but the crater floor has been preserved. Specific Features: Structure is dominated by a 1.5 km wide semi-circular peripheral valley, which lies interior to a ring of hills defining a diameter of -46 km. Interior to the valley lies a plateau and a central peak which rises to -750 m above sea level. The western half of the crater has been tectonically removed by a major fault system which runs down the St. Lawrence Valley. Fault zone and differing geology under the Charlevoix impact structure. I superimposed a schematic of the geologic faulting under the Charlevoix crater onto this aeronautical chart of the crater area. A line drawn west to east on the chart corresponds to the physical position of the schematic illustrating the fault zone and differing geology under the crater. 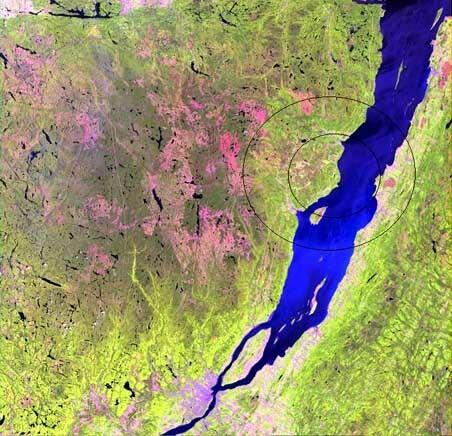 The deepest part of the St. Lawrence River is immediately next to the crater. It is proposed that the meteor impact weakened the rift faults and introduced its own fractures. The present earthquake activity probably occurs along these weak fault surfaces. The effect of the impact crater on the type of faulting versus depth is not readily discernable from available data. In general, meteor impacts do not leave neotectonic seismic signatures therefore the Charlevoix impact crater might represent a different case because of the presence of weakened paleo-rift faults (Lamontagne et al. 2000). Earthquakes are generated at the present times as the broken crust continues to move in response to movement of the continents (R. Eyles; ONTARIO ROCKS). 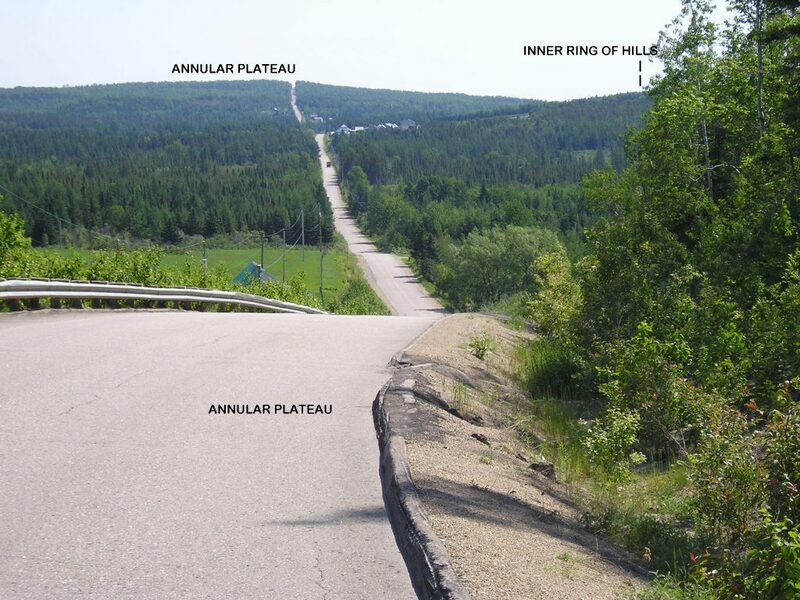 The structure coincides with the most seismically active area in eastern Canada. It is not known whether there is a physical connection between the impact deformation and seismic activity. Charlevoix impact structure Digital Elevation Model with Earthquake Epicentres. The Charlevoix crater region is historically the most active earthquake zone in Eastern Canada, illustrated in this Digital Elevation Model with Epicentres (Lamontagne et al. 2000). The region has been monitored by a microseismic array since 1977, yielding accurate locations of the earthquake’s hypocenters. Previous analyses of data from the array indicated a relationship between the earthquakes and the St. Lawrence Valley paleo-rift faults (Note 6). Within the impact structure, the highly fractured basement releases strain energy in small earthquakes but it is unclear why earthquakes do not occur over the whole impact structure. The larger earthquake events (stars in the Digital Elevation Model with Epicentres chart) tend to be concentrated at both ends of the Charlevoix Seismic Zone located at the periphery of the impact structure. 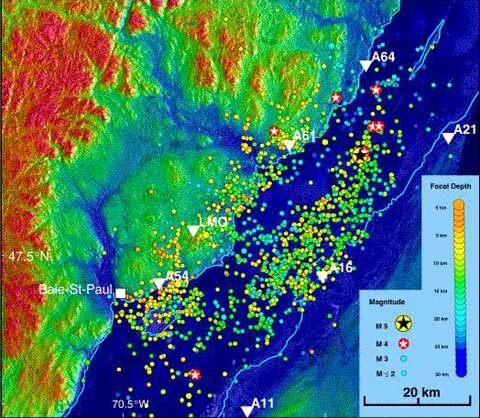 Most of the smaller earthquake events tend to be concentrated to the south east of the crater under the St. Lawrence River where the crater was obliterated and buried by early Palaeozoic sedimentary rock. The Aerial Radar image and Digital Elevation Model with Epicentres are courtesy of Earth Impact Database, 2003. This is a chromo-stereoscopic image (about 80 km by 90 km; 30-m pixel size) that integrates the RADARSAT-SAR ortho-image with terrain elevation and seismicity (each data set with its own colour range). For the elevation, the colour range varies from 0 m in blue to 1100 m in red. The texture of the land surface comes from the RADAR data. While the south shore is a gently rolling landscape, the north shore is a mixture of rugged highlands, plateaus and valleys, separated by dramatic changes in elevation. The earthquake hypocenters (circles) for January 1978-September 1999 are overlain, with colors related to focal depth. White triangles are the stations of the Charlevoix Local Seismograph Network, part of the GSC’s Canadian National Seismograph Network: (www.seismo.nrcan.gc.ca). 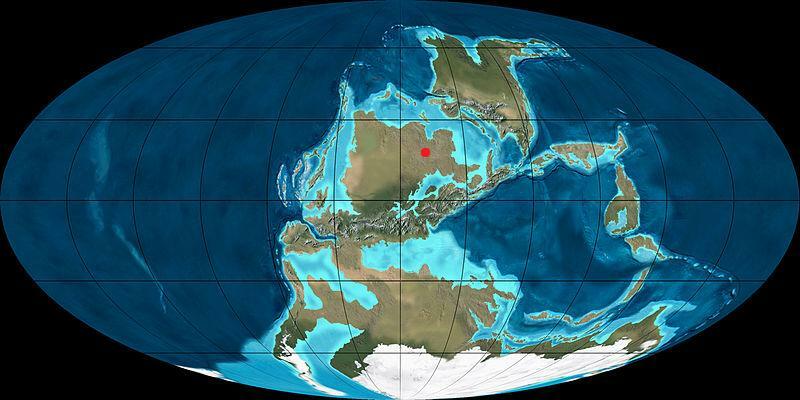 The red dot represents the approximate area of the Charlevoix impact 342 million years ago in the Carboniferous Period. At the time of the impact during the Alleghenian Orogeny, America was colliding with Africa and Europe resulting in mountain building in the area. Fish are dominant in the oceans, the first land animals appear and plant life on land becomes highly developed. RADARSAT radar image of the Charlevoix impact structure depicting the crater morphology. Central peak (Mont Des Eboulements, is 780 metres above sea level). Charlevoix crater. Simplified map showing shock isobars, distribution of shattercones and pseudotachylites, and main topographic and structural features (modified after Robertson 1975; Rondot 1989). The topographic central peak corresponds closely to the 20 GPa isobar. The peripheral trough is a topographic low underlain by down-dropped, strongly faulted and folded pre-impact lower Paleozoic sedimentary rocks. The rim is defined by the margin of a regional plateau with average elevation about 900 m above the river. 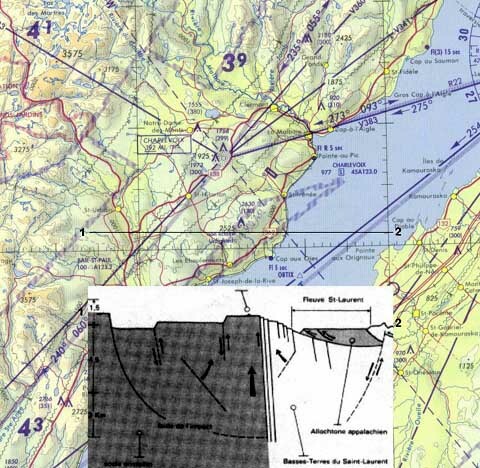 The Appalachian Front (Logan’s line) is the trace of a thrust dipping 20° SE; the St. Lawrence (S-L) fault is a zone of late (still active) normal faulting. Autochthonous breccias in the gneiss (material brecciated but still virtually in place) are prominent along and inside the peripheral trough near the margin of the crater at about 15 to 17 km from the center of the structure. Not all exposures in this zone are brecciated but all rocks at this distance from the center do exhibit an abnormally high degree of fracturing. 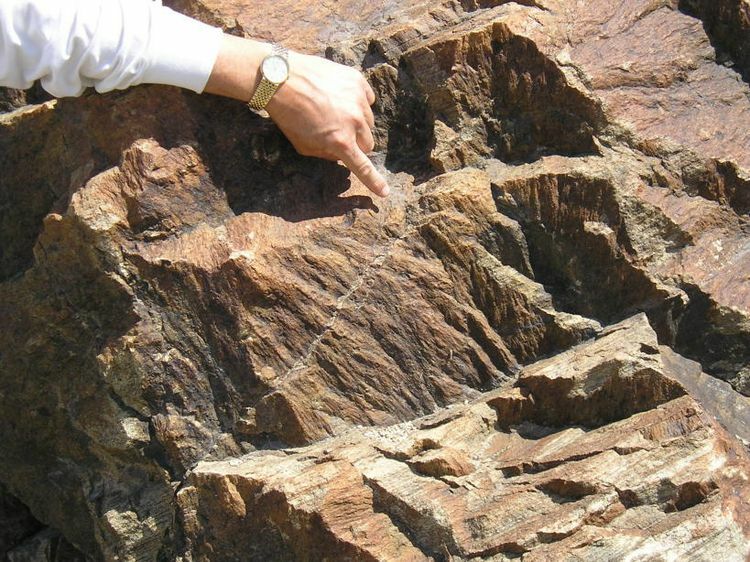 Shatter cones occur both in the Precambrian foliated crystalline basement and in the Ordovician sedimentary cover within 12 km of the central peak. The paleo-rift faults consist of at least four fault lines running parallel in the St. Lawrence River and along its north shore through the Charlevoix crater. The break up of Pangea at about 150 million years ago saw the widespread formation of faults called rifts or grabens. Some widened to become new oceans (North and South Atlantic) but many others “failed” to develop and are preserved today as aulacogens deeply buried below younger strata. Large rivers follow these lines of structural weakness (such as the Ottawa and St. Lawrence rivers). Thrusting along the St. Lawrence River fault lines during either the Taconian or Acadian Orogenies, or both, obliterated the south-eastern portion of the crater. An unknown thickness of early (pre-Charlevoix impact) Palaeozoic sedimentary rock was then transported over the obliterated portion of the crater. Finally the St. Lawrence River flooded the area leaving the semi-circular crater remnant. 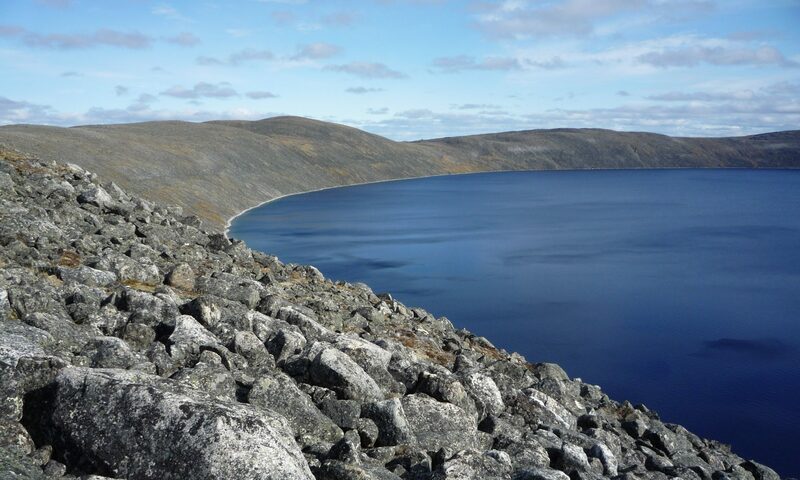 The deepest parts of the St. Lawrence in this area are along its interface with the crater. The missing part of the crater has not been detected under the St. Lawrence River. 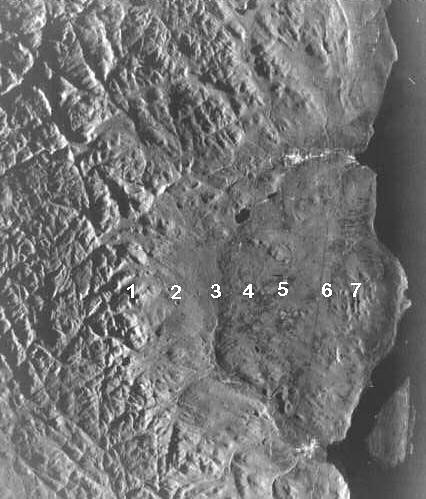 The rocks of Isle aux Coudres, visible at the extreme lower right (south-west) of the image immediately to the south of the crater in the St. Lawrence River, are Palaeozoic sedimentary rocks that have been transported to this position from the southeast after the impact (Robertson, 1968). The water depth of the St. Lawrence River here is relatively shallow but between Isle aux Coudres and the crater it reaches 55 metres or more (Robertson, 1968). The relatively flat Isle aux Coudres does not share any of the Charlevoix impact crater’s geomorphology. The early Palaeozoic limestone deposits on Ile aux Coudres are older than the impacted Ordovician limestone within the crater but they do not show any evidence of shatterconing or brecciation of the types found on the mainland that are at an equivalent distance from central peak Mont des Eboulements. 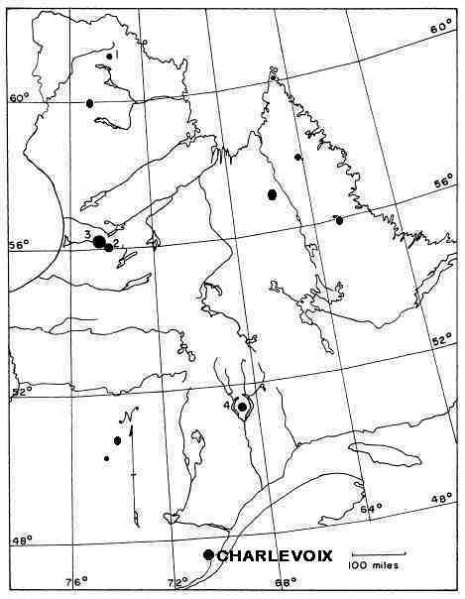 Isle aux Coudres is therefore not a remnant of the missing part of the structure but is an assemblage laid down elsewhere prior to the meteorite impact and transported to its present location by tectonism. This image of the Charlevoix crater (west) looking south from about 2000 feet above the western most area of the impact modified zone taken from GOZooM. To the right are the terraces and in the mid foreground is the annular peripheral trough (ring graben) surrounding the central uplift region. The central peak, Mont des Eboulements, is to the left. The town of Baie-St. Paul , in the centre of the image, is at the south west termination of the crater’s annular peripheral trough. Isle aux Coudres is located immediately to the south of the crater in the St. Lawrence River. It is in the area of the “missing crater” and is not related to the crater in any way. 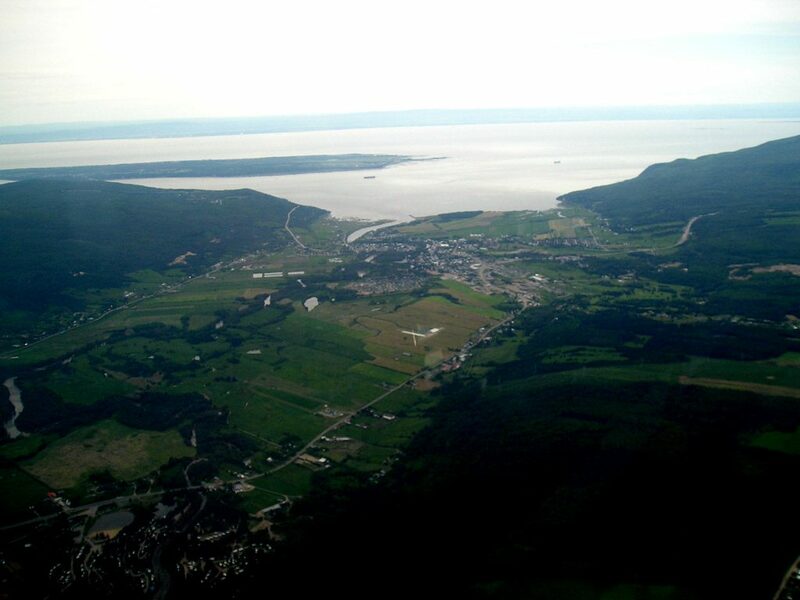 The town of Malbaie in the Charlevoix impact structure just inside the eastern rim of the structure. Immediately to the south west (left) of the town is the annular plateau and further to the west is the inner ring of hills of the north eastern central uplift region of the crater. The steep slope in the foreground along the St. Lawrence River defines the southern termination of the crater. 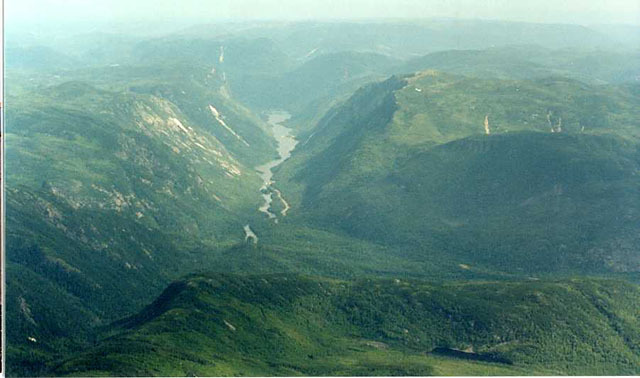 The river is deepest here along the crater with depths of 145 metres just north-east of Malbaie while it is relatively shallow across most of its 18 km width. The central uplift region at the north east area of the crater of the Charlevoix crater is illustrated in this image taken from 2000 feet above ground. The semi-ring of hills, (at right in the image) with an average elevation of 460 metres, lies at a mean distance of 10 km from the crater center (to the left in the image). These hills are separated from the central peak by an arcuate inner valley 2 to 5 km wide averaging 335 metres above sea level, visible in the center foreground of the image. 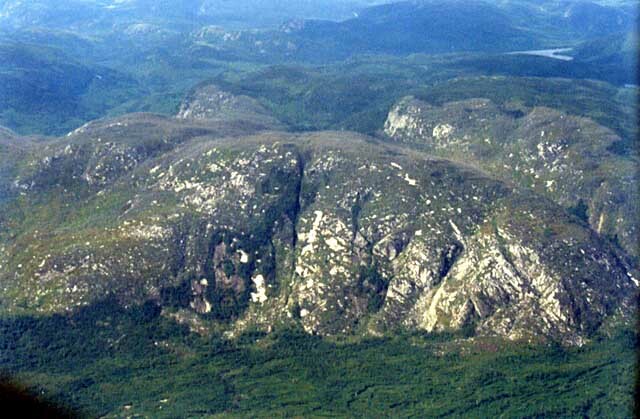 Mont des Eboulements, the central peak of the Charlevoix impact structure, comprise of several steep-sided hills visible in the center foreground of this image. They have a maximum elevation of 780 metres. The size of the Charlevoix meteorite crater and the magnitude of the events that created this structure were impressed on me when it took almost 10 minutes to fly the diameter of the crater zone. As well, I am still struck by the strength of the geological forces that obliterated almost half of this crater and then made it virtually disappear! 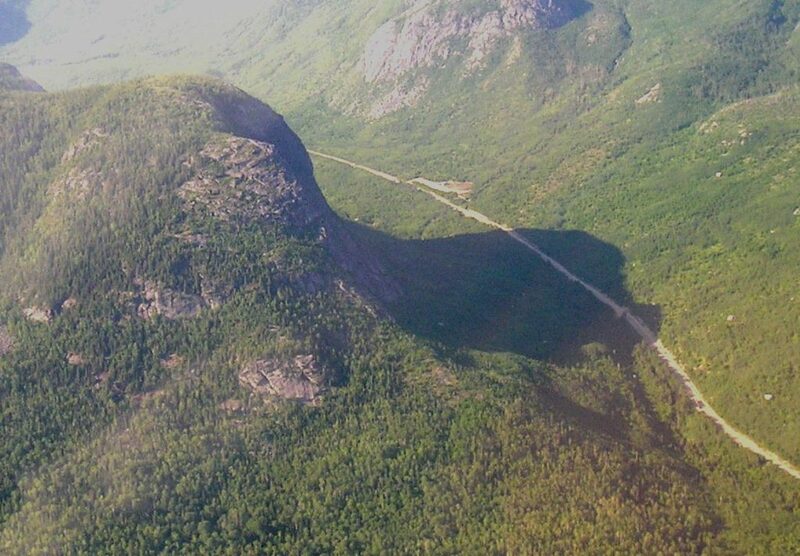 Mont des Eboulements, the central peak of the Charlevoix impact structure. The western extreme post impact modification zone of the Charlevoix impact crater. The target rock is Precambrian, crystalline and Palaeozoic sedimentary containing Grenville age granitic gneisses and migmatites (in the east part of the crater), charnokitic gneisses (in the centre and north) and anorthosites and gabbro (to the west). The remaining 5% of the rocks are Ordovician metasediments, mainly limestones. Eroded country rock around the north-western part of the crater 5 km north of the crater modification zone. I wanted to include this image as it was typical of the Grenville rock scenery in the area to the north of the crater. 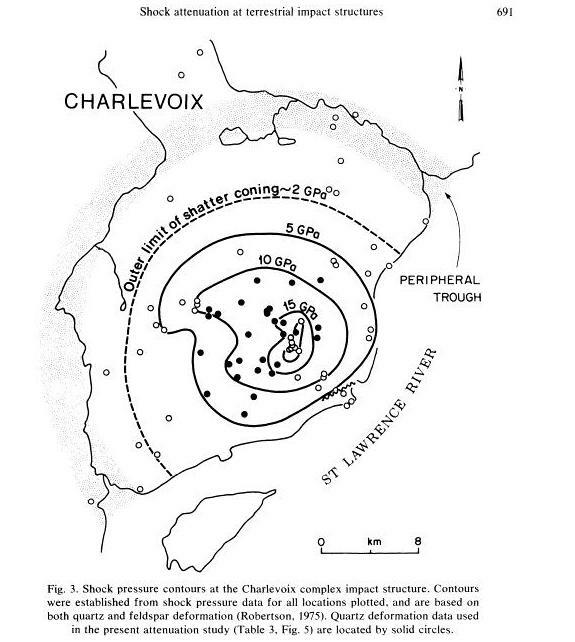 In the summer of 2005 Ron St. Martin and I spent a few days exploring the Charlevoix impact structure. Yours truly on the annular plateau of the Charlevoix impact structure. My trusty bird GOZooM is in the background. As the central uplift of the structure was being formed, rocks around the periphery of the transient crater collapsed downward and inward to form one or more depressed rings (ring grabens or troughs). Here I am standing on the north-east portion of the annular plateau that was formed during the crater periphery collapse. The inner ring of hills and the central peak are visible behind me. If I was standing here at the time of impact, I would certainly be having a very bad day (but I am enjoying myself here)! The annular plateau (south-west) of the Charlevoix impact structure. A short distance behind from where this image was taken is this bedrock outcrop containing the in situ shatter cones confirming impact. The airport is located on the annular plateau that is visible in the background to the north-east in this image. In the center of the image is the trough that separates the annular plateau from the inner ring of hills. This image was taken from the south-western section of the annular plateau facing north-east. 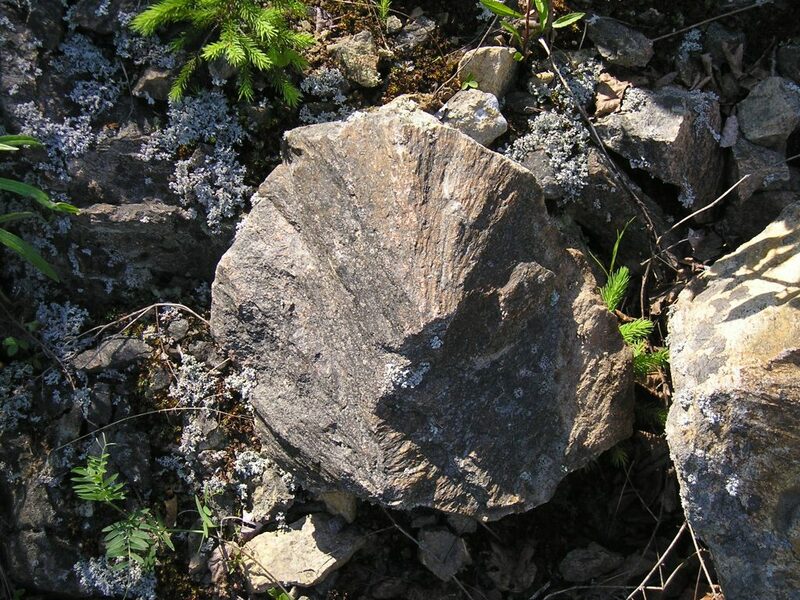 This shatter cone in charnokitic* gneisses was found to the north of the central peak of the Charlevoix impact crater. *Charnockite is a granofels that contains orthopyroxene, quartz, and feldspar and is frequently described as an orthopyroxene granite. Granites are felsic rocks that usually contain no or very little pyroxene. Scattered shatter cone in the Charlevoix impact structure. In the small trough dividing the inner ring of hills from the annular plateau is a series of shattercone deposits like the one illustrated here. Verification of an impact origin requires the discovery of unique impact-produced features. At present, one of a few of the accepted impact features is the presence of shatter cones. 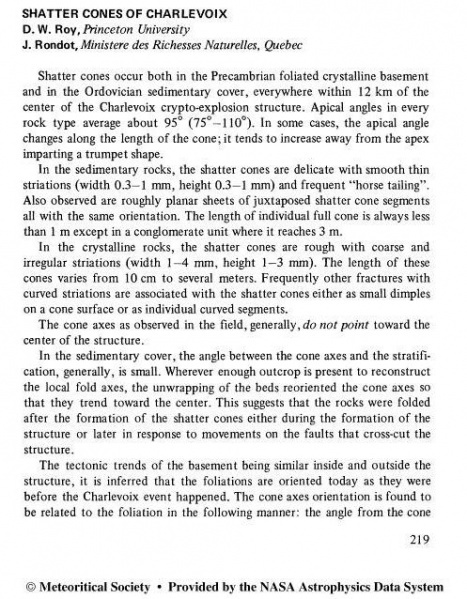 In the field, well developed and indisputable shatter cones are the best indicators of impact if they are distinctive and widely distributed, especially in the basement rocks of deeply eroded structures. 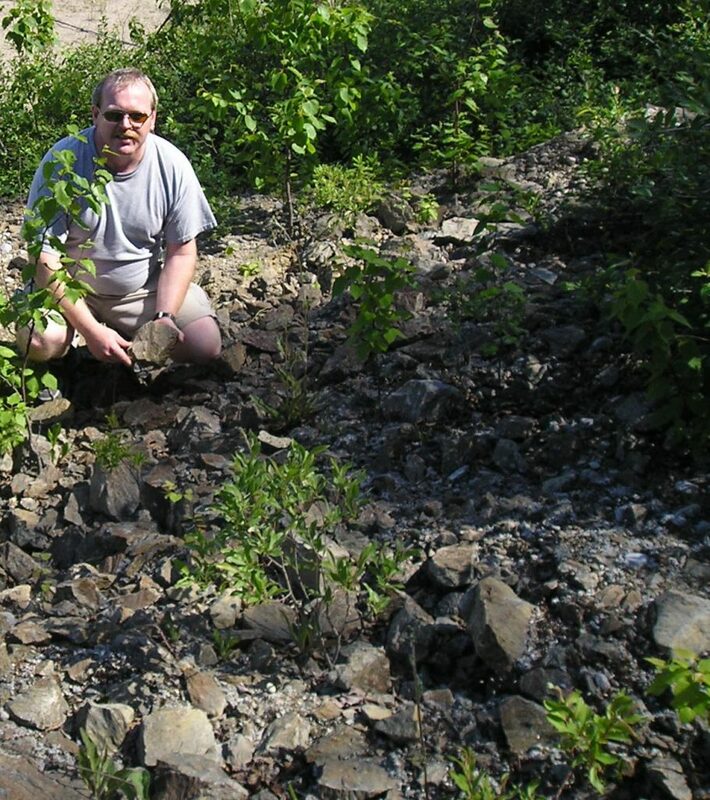 Ron posing with a prized shatter cone in the Charlevoix impact structure. Unfortunately for both of us, the gross weight allowance of my airplane dictated that we could only take on so much additional weight in order to safely return home. For this reason we had to leave many excellent shattercones specimens behind. Ron once asked me if we could take back a very large shattercone we had found, and I regretfully answered, “Yes, but you will have to stay behind”. Another feature that verifies an impact origin is impact melt rock. 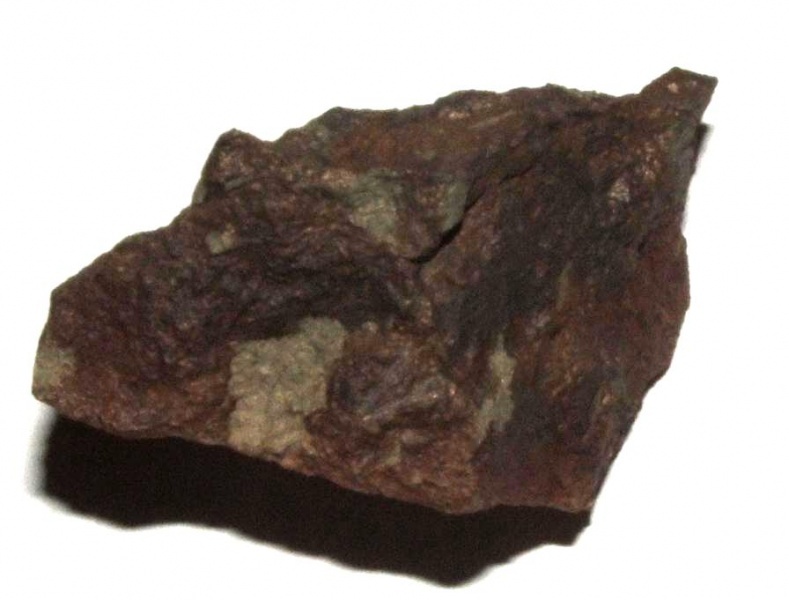 At pressures in excess of about 60 GPa, rocks undergo complete (bulk) melting to form impact melts. The melts can reach very high temperatures due to the passage of shock waves that generate temperatures far beyond those commonly encountered in normal crustal processes or in volcanic eruptions. Each mineral grain is instantaneously raised to a post-shock temperature that depends on the shock-wave pressure and on the density and compressibility of the mineral itself. If the postshock temperature produced in a mineral exceeds its normal melting temperature, each grain of that mineral in the rock will melt, immediately and independently, after the shock wave has passed. The melt will have approximately the same composition as the original mineral before any flow or mixing takes place, and the melt regions will initially be distributed through the rock in the same pattern as the original mineral grains. Note the country rock fragment in the inclusion. The Charlevoix impact crater from the south-western outer margin terrace adjacent to the St Lawrence River. Subsequent tectonic deformation erased a substantial portion of the Charlevoix structure to the south (right in this image). The Charlevoix impact structure, from the north. The collapse (slump) of the crater periphery immediately after impact formed a series of terraces along the outer margins of the final structure (as well as the depressed rings and central peak). This image of the Charlevoix impact structure was taken from the northern terrace of the structure’s outer margin. Turning 180° from the spot where the previous image was taken reveals the first edge of the Precambrian country rock at the outer modification zone. Formation of the crater results in a circular structure outside of the impact structure that consists of deformed subcrater rocks. Erosion removed the surface ejecta blanket and destroyed any surviving meteorite fragments from this area. Erosion of the Outer Modification Zone north of the Charlevoix impact structure. The assemblage of distinctive near-surface rocks, directly outside the terraces along the outer margins of the structure, was immediately subject to geological processes. On our way home we flew over the northern rim of the impact structure from where we took the previous image. This image documents the amount of erosion that took place here over the course of the 342 million years since the impact. M. Lamontagne, P. Keating & T. Toutin; Complex Faulting Confounds Earthquake Research in the Charlevoix Seismic Zone, Quebec:, 2000. Robertson, P.B. 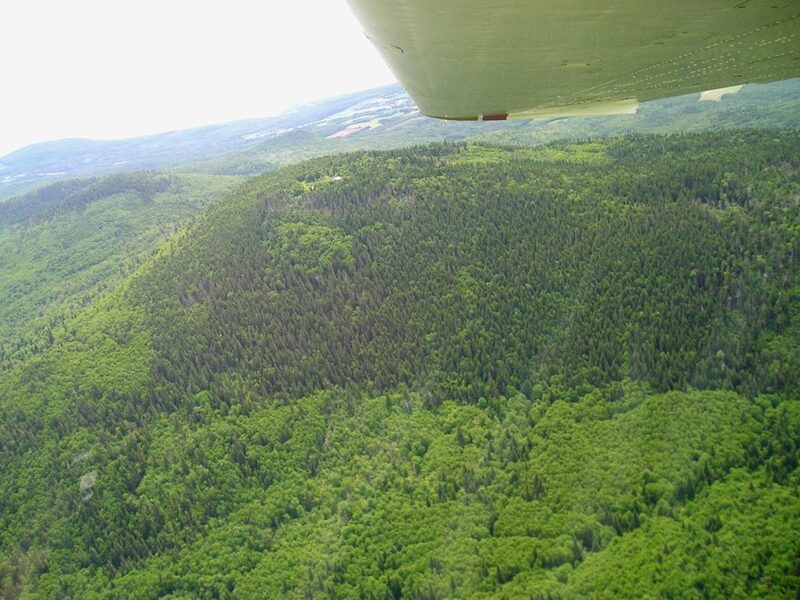 ; La Malbaie Structure, Quebec – A Palaeozoic Meteorite Impact Site: Meteoritics, Vol. 4 No. 2 October, 1968. Rondot J. Geology of the La Malbaie region, Charlevoix. Quebec Preliminary Report 544. Quebec: Department of Natural Resources. 18 p. 1966. Rondot, J., Impactite of the Charlevoix structure, Quebec, Canada. Journal of Geophysical Research, v. 76, pp. 5414-5423. 1971. Rondot, J., Charlevoix and Sudbury as gravity-readjusted impact structures, Meteoritics & Planetary Science, v. 35, pp. 707-713. 2000. Whitehead, j., Grieve, R.A.F., Garvin, J.B., Origin of “toasted” quartz in terrestrial impact structures; Geology, V. 30 P. 431-434, 2002.